Dawson the horse - see the cowboy riding him? I can't wait to see your costumes and maybe get some ideas for the future! Dawson is so cute!! I bet you are very excited about this year and being able to dress up sweet Harper! Can't wait to see pics! We dress up our dog every year, too!! This year she is a pink caterpillar, and I can't wait to take pictures!! Harper is the cutest pig I've ever seen!! Nothing cuter than dressed up pooches! Thanks for the fun Show Us your Life topic. I had a great time going through old pics. Dawson is too cute! 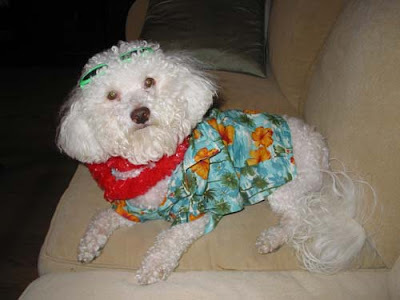 He makes a good Hawaiian tourist! Have a great weekend! HAHAHA, that is awesome!! you're right... the hawaiian is the cutest! 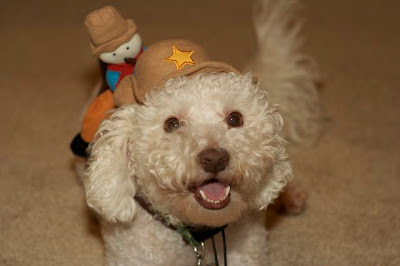 I love the cowboy costume, too cute! I'm sure your excited about dressing Miss Harper up this year! I already did a Flashback Friday post about costumes and decided to link to yours since mine is about costumes (and pumpkins)! I just happened to post yesterday about a last minute costume change and then I saw this so I linked up! First time linking here! Lots of fun entries! Dawson is super cute! I seen a sneak peak of Harper from your previous blog and I have to say what a cute little piggy! I can't wait to see the pics from Halloween! Lol! I LOVE the hawaiian one. I have to say I never thought about dressing our dogs up for halloween....I might have to try that next year! ahah too cute. I don't think my cat would allow me to dress her up lol. Your dog is SO cute. I love the costumes and can't believe Dawson lets you put them on...my dogs would not keep them on. I tried to link but entered in too many ttt's on http..could you delete my link and I will try again? McLinky wouldn't let me do 2 links. BTW..Harper looks adorable in her costume! Kelly, that little Dawson is such a good sport. My dog would have never gone for that. :) I have a question from yesterday's blog, where do you get all of the petit fours? I love them! Dawson sure is cute - and way more tolerant than my cat! I dressed her up tonight and posted photos. Too fun, and now I can't wait until next year! This is a great SUYL topic. I really enjoyed looking at other costume ideas!